The Canfield Connector Series 9D is a universal, ultra-small, magnetic proximity switch available in both solid state electronic and reed styles. These sensors are designed to fit the most stringent space requirements by use of a standard .250 inch dovetail slot. Many other mounting options are also available. The electronic sensor exhibits greater sensitivity to magnetism with reduced dead-band and hysteresis as compared to competitive devices. The reed sensor offers a wide operating voltage range. The molded switch has an on board indicator light that can be viewed from wide angles. 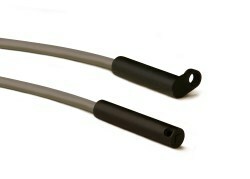 Standard connection to the sensor is provided by a 9 ft. PVC or 8mm quick connect male pigtail. The rugged, fully encapsulated switch is shipped with mounting hardware ready for installation.